The EB Warehouse Sale is back! A: From Saturday 27 April to Wednesday 01 May 2019. Doors open each day at 8am and close at 4pm. Q: Will there be dedicated parking for those attending the sale? A: No. Parking is on the street, with limited spots. There is also construction taking place in the area currently that has an impact on parking availability. We recommend carpooling or Ubering to the sale. If you bring your car, please be considerate of those working in the area when parking. Please do not park anyone in or obstruct the entrances to the businesses in the area. Q: Is there a list of books I can buy from if I cannot attend? A: No, this is unfortunately not possible. Q: Does this mean books in store will be available for R35? A: No, the sale is only available at our warehouse. Q: Will there be children’s books available? A: Yes! There will be a wide selection of children’s books available, but as these are always the first to sell out we recommend that those looking to buy them attend the sale early in order to avoid disappointment. Q: Can I bring my kids with? A: While we do not discourage children attending, the warehuouse sale is often quite busy and may be an intimidating space for younger children. Q: Can I use my Fanatics card, Fanatics Coupons or gift vouchers at the sale? Q: Will there be credit card facilities available? A: There will definitely be credit card facilities available. Q: Will every book on the sale be R35? Even if it is a Hardcover book? A: Yes! Absolutely everything on the sale is priced at R35. Q: I am looking for a specific title or genre, can you tell me if there will be stock available? A: There will be a wide range of stock available but we cannot guarantee availability of any specific titles or genres. Q: Why is there no Warehouse Sale in Cape Town or Durban? A: We only have one warehouse currently which is based at our Head Office in Johannesburg. We do regularly host in store sales with similarly priced titles for the benefit of all of our customers. Q. I can’t make it on the Saturday, will there still be good books left by Wednesday? A: We will replenish the sale with fresh stock each day. Although there will be a large range of titles, we cannot guarantee how long stock will last. The sale will be on a first-come, first-served basis. Q: Can I order books from the warehouse sale online? A: No, the sale is a physical sale and will not be available on our website. Q: Is there an entrance fee? A: No, the warehouse sale is free to enter. Q: Will there be a limit on the amount of books I can buy during the sale? Q: Will the books be organised into genres? A: Our warehouse staff do attempt to keep the books organised by genre as much as possible, but with constant browsing throughout the day it is often impossible to keep them this way. Good afternoon. I’m unable to attend the book sale this year. Can I sent my title’s through and than pay via EFT and the postals cost? First boom will be from the author Stanley Manong- if we must die and all three book by Sandile Dikeni- guiva juice, soul fire and planting water. Unfortunately we do not have a list of the titles on the sale so we are not able to take orders or EFT payments for the sale. So, you as a national company, are holding a sale for the benefit of only your Johannesburg-based clients? And you do not think that is wrong? The warehouse sale is hosted in Johannesburg because that is where our warehouse is based. We regularly hold in store sales with similarly priced books for the benefit of all of our customers not based in Johannesburg. Please keep an eye on our social media for updates on in store sales. Will you guys have harry potter books at your sale? There will be a wide range of stock available but we cannot guarantee availability of any specific titles or genres. Will there be cook books there? Will the warehouse sale be on Sunday as well ??? The warehouse sale runs from Saturday 27 April to Wednesday 01 May 2019. Doors open each day at 8am and close at 4pm. Do you have a pre-sale open day for booksellers? 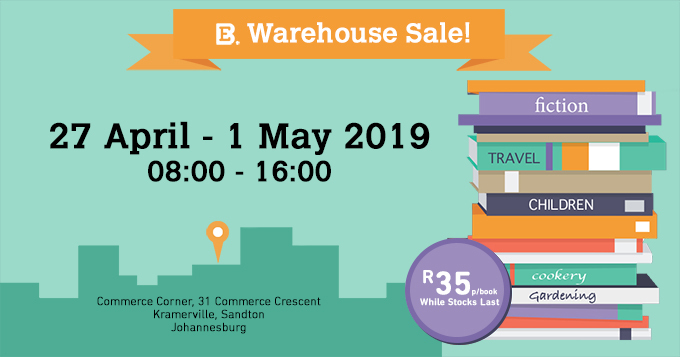 The warehouse sale runs from Saturday 27 April to Wednesday 01 May 2019. There will be no pre-sale day. Will there be Golden tickets for early entrance? We do not currently have plans to run a golden ticket competition for the sale.